$25/6 meals = $4.16 per serving. One of the downsides of living in New York is that it’s very hard to barbecue without doing something either unsafe or illegal. While I’m happy to take some risks, I’d rather not find myself with a summons from the city for grilling on the sidewalk. So when I found out I’d be visiting my dad in NH for the week, I checked the weather and decided that overcast skies and 50 degree weather sounded like nearly ideal cookout conditions compared to what I was used to. It was time to fire up the grill. The Concord, NH Farmer’s Market was not scheduled to open for another month or so and my favorite local farms were closed as well. So we were off to the Concord Co-op which sources vegetables, dairy, eggs and meats from nearby http://www.concordfoodcoop.coop/. I knew we were about to get flooded with the early spring vegetables, but for now, the late winter vegetables would have to do. My father is a big fan of chicken so I wanted to see what might be available. Misty Knoll is a VT poultry farm that raises very good chickens and turkeys (http://www.mistyknollfarms.com/). For those of you who haven’t grilled a farm raised chicken, the difference in the quality of the meat (particularly the breast meat) is striking. 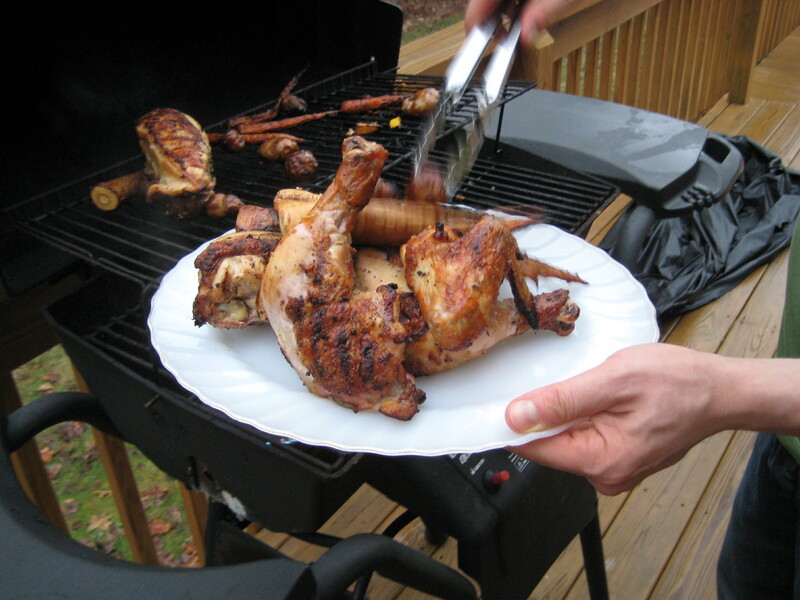 Overly lean factory farmed chicken meat just can’t remain moist and flavorful on a hot grill. Give the better chicken a shot and the difference will be very clear. The Misty Knoll chickens weighed about 3.5 pounds and are sold fresh for around $4.20 a pound. The cost of the bird was $15 and a nice bag of organic parsnips, carrots and sunchokes ran me about $8. We also found a piece of a deliciously sharp raw milk cheese called Landaff ($3), also a NH product (http://landaffcreamery.com/Our%20Cheese.html). It’s nutty and almost a little ‘citrusy’ and would be perfect with a spoonful of jam for dessert. That brought our total grocery bill to $25. During the summer, I love to grill fish or meat along with lots of summer veggies like yellow squash and peppers. In the winter, I tend to use heartier winter vegetables that work better roasted for a long period of time. I essentially wanted to make a dish on the grill that I usually make in the oven. Not too hard actually. I started by drizzling some olive oil and lemon juice over the cut up chicken and vegetables along with some salt and pepper. Over a hot grill, I cooked the chicken pieces skin side down and then turned them. Then, I added the veggies to the grill and placed the chicken pieces on top. People roast vegetables in the same pan with meats because the juices and fats from the meat flavor the veggies and help them to cook more evenly. Why not try the same thing on the grill? While most of the juices would be lost to the fire, some would no doubt season the vegetables along with the smoke from the fire. When the meal was plated, we realized, we had another chicken breast for the next day along with most of the trimmings and carcass which could very easily be made into a chicken soup for later. We even had a handful of extra sunchokes which could make the soup even nicer. So along with the 3 dinner servings, we had more than enough for at least 3 more lunches or dinners with the leftovers and 0 court appearances for violating the NYC Fire Code. If breast meat cooks sooner, remove from grill and cover loosely with foil. If you’d like, drizzle the cooked chicken and veggies with some additional lemon juice or olive oil. This meal is best with beer. Drink it. Enjoy. About a year ago I started speaking with a butcher named Jacob Dickson. He sources beef and lamb from small farms and has very high standards for animal welfare and sustainability. Recently, Jacob opened Dickson Farmstand Meats in Chelsea Market.The space is beautiful and the meat case full of beautiful pieces of both grass and grain fed meats. Occasionally, Jacob runs out of popular cuts. One of the things I love about shopping there is hearing him offer alternatives to people who came looking for a rib eye steak but are not sure how to cook flank or a small chuck roast. About a week ago, I went to pick up some lamb chops for a quick dinner party I was hosting for a couple friends of ours. I had already made some potatoes earlier in the day and needed 4 small loin or rib chops. The three customers in front of me all wanted cuts that were not available that day but Jacob had beautiful tri-tip roasts and was eager to help them learn how to work with new cuts. When it was my turn, I asked for four small lamb chops but was then informed that there was little lamb that week and that all that was left was shanks. “Give them around 2 hours and they should be fine,” Jacob said. I knew I did have the time and wasn’t sure what to do. As much as I liked seeing other customers readjust their cooking and eating around what was available that day, I didn’t like it quite as much when it happened to me. I consider myself a decent to good cook but I still get thrown off when cooking and eating plans have to changed completely. I’m thinking though that that might be an important part of going local. Few of us will be walking out into our gardens to see what’s ripe and then planning our dinner from there. 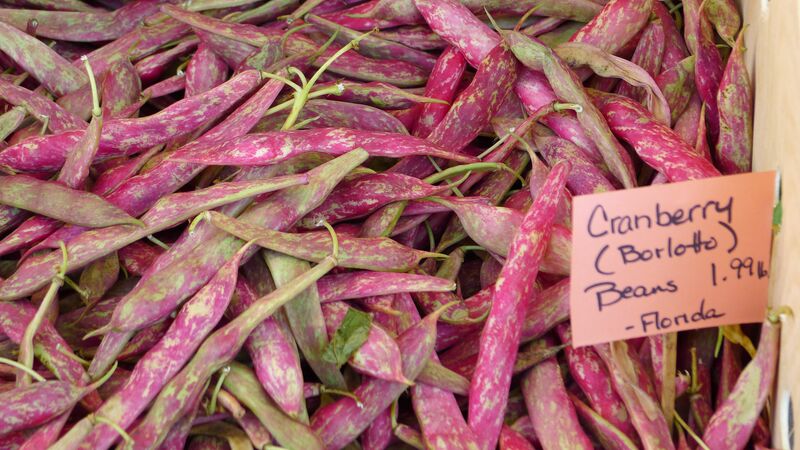 But we may go to the farmers’ market or open a box from a CSA and let our findings guide our next few meals. In any case, when my guests arrived, we enjoyed a bottle of wine for an hour or so, salad for a bit longer, and then braised lamb shanks. Many of us our in a rush, but a little extra time is a small price to pay for good food that was sourced responsibly. While the lamb is browning, dice up some carrots and onions or whatever veggies you can find. Anywhere from 1-4 cups is fine. When the lamb is done, transfer it to a plate and brown the veggies for 4 minutes or so. Place in oven at 300 degrees and cook for about 2 hours. 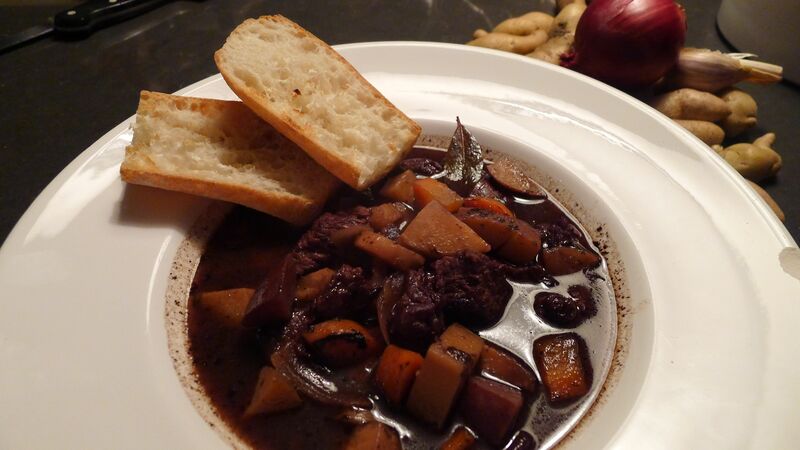 Serve with the reduced liquid from the bottom of the pot with some bread on the side.